Dr. Nawrocki has been thoroughly trained in providing denture services to the residents of Orange Park and surrounding communities. We will cover a brief introduction of dentures, but if you are missing teeth or have teeth that you feel you may lose, we understand that this may not answer all of your questions. Feel free to contact us anytime for more answers. Dentures are indicated for the replacement of missing teeth. Teeth can be missing for a myriad of reasons. Teeth that are congenitally missing, missing due to trauma, infection, decay, or any other reason can be replaced with dentures. First and probably the most obvious benefit is aesthetics. When someone is missing teeth that can be seen when speaking or smiling it can have profound consequences. This becomes the focal point of that person’s appearance. There are other aesthetic consequences of missing teeth that may be less obvious. Teeth provide soft tissue support for the cheeks. When teeth are missing the cheeks tend to sag and indent. This causes the person to look much older than they really are. The social consequences of missing teeth are a difficult hurdle for patients to overcome and many people find themselves aware of it with every smile or social interaction. In addition to the aesthetic issues, loss of function is a consequence of missing teeth. Chewing can be difficult if teeth are missing, especially those in the back of the mouth that shoulder much of the load of mastication. When a tooth is lost and not replaced, the adjacent teeth tend to drift into the position that tooth used to occupy. This can cause serious consequences to that person’s bite, teeth in the opposing arch, and surrounding muscles. Finally, speech can be challenging when teeth are missing. The natural teeth are designed in an intricate and beautiful pattern to provide the perfect conditions for speech, and dentures are specifically designed to replace that function. Dentures are complex in design and have many different varieties, each created specifically for a patient’s individual condition. First, complete dentures are designed to replace an entire upper or lower arch. These are indicated when all of the teeth in that arch are missing or when the remainder of teeth are to be extracted. 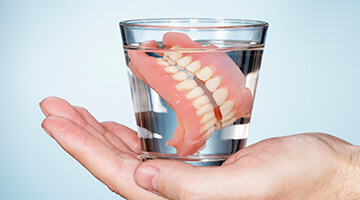 Dentures are constructed of a special denture base and either ceramic or porcelain teeth. Aesthetics, function, and speech patterns are all taken into account when creating dentures. The result is a full replacement of teeth that looks natural as well as a restoration of form and function. Next, there are removable partial dentures. These are indicated when there are several teeth missing in an arch. Removable partials utilize the existing structures of the mouth to retain the prosthesis and replace the missing teeth aesthetically and functionally. Fixed partial dentures are another form of dentures. Otherwise known as bridges, these dentures are utilized generally for the replacement of one or more consecutive missing teeth. The difference between fixed partial dentures and removable partial dentures is that these are dependent upon adjacent teeth for retention. Generally the natural remaining teeth are prepared and crowned, and these connectors hold the new tooth or “pontic” in place. Finally, implant supported dentures can be used to replace missing teeth. Dr. Nawrocki utilizes the technology of Hybridge Dental Implant systems. This is a terrific method to replace missing teeth in an entire arch utilizing the support of five or six dental implants. Feel free to visit the Hybridge website for more information. If you are missing teeth and would like to replace them, a thorough consultation with the dentist is necessary. The complexity of each situation requires many factors to be considered.